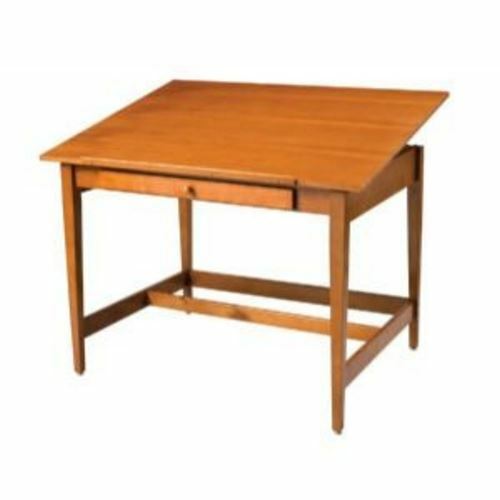 A classic 4-post wood table that is perfect for art, crafts, drafting, and all kinds of creative work in the home, office, or studio. Made from eco-friendly, sustainable rubber wood that is valued for its dense grain and is often compared to fine teak. Finished with a medium stain and durable polyurethane. The 36" x 48" work surface provides plenty of room to spread out while the spacious drawer provides convenient access and storage for your supplies. Attractive tapered legs are 2" square at the top for stability and a footrest is included for comfort. Through-bolt hardware for years of wobble-free service. Warp-free top has a natural birch veneer. 36" x 48" top with natural wood veneer, ¾" thick. 33 " fixed height with floor levelers for stability. One-hand ratcheted tilt mechanism adjusts board angle from 0° to 25°. Drawer includes movable dividers. Inside dimensions 17" x 27" x 1 ". 32" wood pencil ledge can be set flush or elevated. Sturdy 4-post construction with durable polyurethane finish. Finest quality solid rubber wood legs. Base and tabletop packaged in one well-protected carton. Made with materials that comply with strict.California emission standards. 3-year limited warranty.